For many men (and women), the pop of a beer bottle is the sound of pure relaxation. The world drinks millions, maybe billions, of cans, bottles and pints of beer every year. From amber ales to hearty stouts and porters, beer is available in many delicious flavors. There is a local pub, bar or dine-in brewery on practically every street corner more than happy to serve us up a “cold one”. Additionally, festivals have been devoted to celebrating this well-loved libation with the most famous being Oktoberfest in Germany that hosts more than 6 million revelers per year. 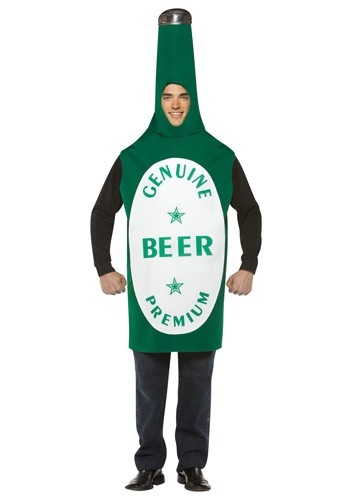 Beer bottle costumes are available to dress you up in traditional style for general beer-drinking merriment or to make you quite the silly ice-breaker at any party. German inspired costumes, such as the national outfit of suspender pants called lederhosen or a flirty beer hall girl costumes, are sure to quench your thirst for a traditional beer costume. Have some fun with beer bottle glasses, a tongue-in-cheek poke at the “beer goggle” syndrome that makes everything and everyone look a whole lot better after a few beers. A real crowd please for any party; dress up in a foam beer bottle costume and round up five friends to join you as a 6-pack. Cheers!